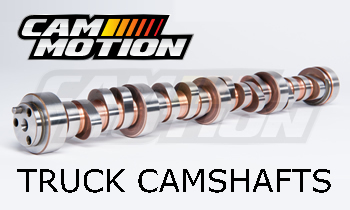 Cam Motion’s truck camshafts are engineered to increase power while still maintaining excellent torque characteristics needed in a truck or SUV. These camshafts are designed to work in a completely stock truck/SUV or a vehicle with other performance modifications such as free flowing exhaust or air intakes. Our truck/SUV cams are available in “drop-in” or “high-lift” versions. The “drop-in” cams even work with stock valve springs while our “high-lift” version require the use of our performance upgrade valve springs.